There is big history behind the Bollywood. Dadasaheb Fadke made first Bollywood movie which was Raja harishChandra in 1913. And this film is know as first silent feature film of India. 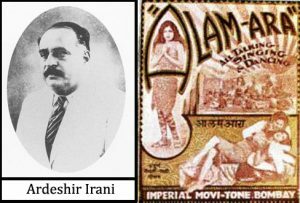 Alam ara the first sound movie of India in 1931 made by Ardeshir Irani. This was great commercial success of the Indian film industry. In 1937, “kisan kanaya” first color film of India made by Ardeshir Irani who made first sound film. Then next year he made second color movie “MOTHER INDIA” which was one of the most popular movie of Bollywood. Then golden age started. From 1940 to 1960 was golden age of the Indian film industry. During this period very succesfull films given by hindi film industry in which we can include the Guru Dutt films Pyaasa in 1957, Kaagaz Ke Phool in 1959 , Awaara of raj kapoor in 1951, Aan of Dilip Kumar in 1952 and Shree 420 in 1955 these all film was maked history. These film expressed social message which mainly dealing with the working class poor life. Some famous epic films of Hindi fim industry also produced at this time, in which Mother Indiaof Mehboob Khan in 1957 this film nominated for the Academy Award of Best Foreign Language Film and Mughal-e-Azam of K. Asif’s in 1960, Madhumati in 1958 which directed by Bimal Roy and Ritwik Ghatak was writer of this film. This film was popularized for this theme which based on Western popular culture. That time many Successful actors was in industry .Such as Dilip Kumar, Raj Kapoor Dev Anand, and Guru Dutt , and many successful actresses was at these time we can get name of Nargis, Vyjayanthimala, Nutan, Madhubala, Mala Sinha and Waheeda Rehman .